We’re back in session at Walden School of Liberal Arts and this year I’m teaching courses in astrobiology, forensic science, multimedia, 3D animation, and computer literacy. We alternate chemistry every other year, since we are a small school, and therefore I’m able to teach some unusual science classes. Because my focus is on astrobiology this semester, the blog posts for this Elements Unearthed website will have a decidedly planetary science flavor for the next few months. As much as possible, I’ll try to weave the stories of the elements into our quest for life elsewhere in the universe. I’ve spent much of the summer trying to arrange authentic learning experiences using real data for my students and for the students in the physics classes. I still get e-mails from NASA programs that I’ve participated in, and these often contain some wonderful student opportunities. I’ve been pretty successful finding some fun and meaningful projects. Our first is to create a realistic animation of how the moon formed for the Center for Lunar Origin and Evolution (CLOE) in Boulder, Colorado. Here is a link to their website: CLOE Homepage. They are part of the NASA Lunar Science Institute and study the evidence brought back by the Apollo astronauts, trying to determine how our moon first formed and how it evolved over time. This has important implications for astrobiology because it gives us clues to the early solar system and how planets form in general and how some planets (such as Earth) develop life and others (such as the Moon) don’t. 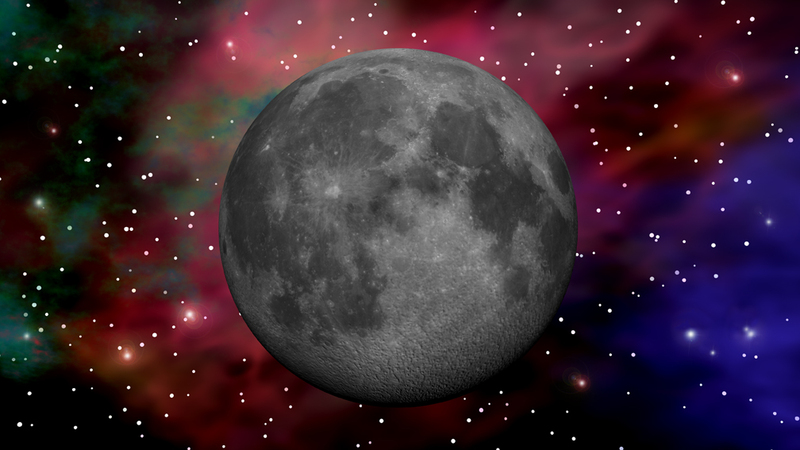 A successful theory of the Moon’s formation has to explain some strange, anomalous facts about the Moon and its rocks. First, the Earth-Moon system has too much angular momentum compared to other planetary-moon systems. No other planet (unless you count Pluto) has a moon so massive compared to the planet, and adding up the total mass and rotational and orbital speeds gives too much energy for a stable system. In fact, the Moon is slowly spiraling away from the Earth. Second, the rocks brought back show that at one point about 4.5 billion years ago the entire surface of the Moon was molten, a magma ocean, at a time when the Earth already had a solid crust. If the moon formed slowly, by accretion, then there wouldn’t have been enough energy to totally melt the surface. The moon must have formed quite quickly (in a period of only a few years) for there to have been enough heat. Also, since the Moon is smaller than the Earth, one would expect it to have cooled down sooner, not later. Third, the elemental composition of the Moon’s crust very closely matches Earth, especially Earth’s mantle, right down to the precise isotopes of elements. 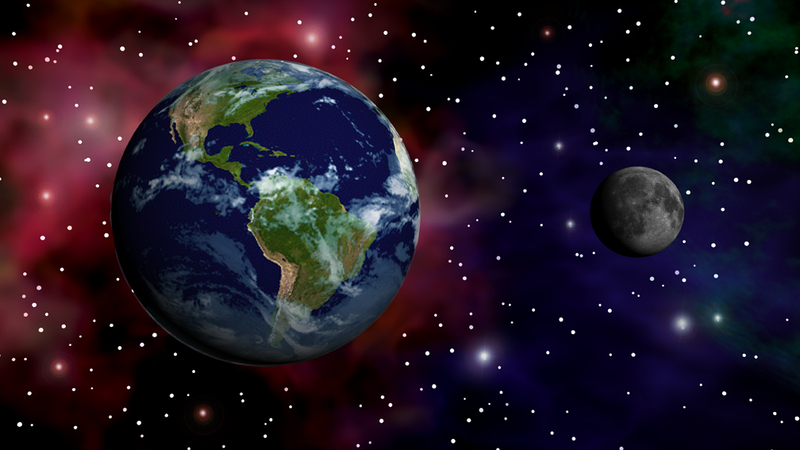 Fourth, the Moon has a smaller iron core than it should have for an object its size (Earth, for example, has an iron/nickel core that takes up 1/3 of its mass, the Moon’s iron core is less than 5%). If it formed on its own either in Earth obit as a twin planet or was captured later, it should have different isotopes and a larger iron core than it does. Fifth, the Earth’s axis is tilted about 23.5° from the plane of the solar system (the ecliptic) and the Moon’s orbital path is closer to Earth’s tilt than it is to the ecliptical plane (only about 5° off). Otherwise, we would have lunar and solar eclipses each month. Sixth, the moon’s elements are different than one would expect for an object that size compared to other similar objects in the solar system. It has more titanium and aluminum but much fewer volatiles – that is, chemicals like water, methane, and ammonia that evaporate easily. Even the rocks are extremely dry, without any hydrates to speak of except small deposits in shadowed craters near the lunar poles. So the Moon is both very similar and somewhat different than the Earth. How do you account for these facts? The theories of lunar formation prior to Apollo were: 1.) The Moon formed at the same time as the Earth, both accreting from the same cloud of planetesimals, with the Moon already in orbit around the Earth as it formed. 2.) The Earth started out rotating very fast and spun the Moon off. 3.) The Moon formed elsewhere and was captured into Earth’s orbit. A careful look at each theory shows facts that contradict it. Theory 1 (co-formation) is negated by the high angular momentum of the Earth-Moon system. Theory 2 (spin-off) is contradicted by the magma ocean early in the Moon’s history and by the fact that the Earth couldn’t have ever spun fast enough for this to happen. Theory 3 was the leading contender for years, despite the Moon’s large size, but the identical isotopes show that the Moon must have come from the Earth, not elsewhere. None of these theories can account for the unusually small iron core and lack of volatiles. I find it really fascinating from both a chemical and a planetary science standpoint that by analyzing a few hundred kilograms of moon rocks brought back by the Apollo astronauts, we can tell so much about events 4.5 billion years ago and answer age-old questions. This is why we must eventually send humans to many locations on Mars – even with sample return robotic missions, the chances of answering the riddles of the Red Planet are small unless we have people with trained minds and eyes on the surface to put it all in context and find the right specimens to study back on Earth. Our job will be to take this theory and turn it into a believable animation. My astrobiology students will research the details and evidence, create the storyboards, and ensure the accuracy of the animation while my 3D modeling students create the actual objects, textures, scenes, and animations. It will be challenging, involving particle effects, physics, and some very sophisticated compositing techniques, but I think we’re up to it. I look forward to the challenge! Meanwhile, I continue to apply to programs that we can participate in where our unique capabilities will be put to good use. Then was it Earth that eventually caught up with the Theia at 5 km/sec or was it Theia the Mars sized planet in Earth’s orbit that caught up with Earth at a 5km/sec greater velocity??? According to the Giant Impact hypothesis, Theia was the Mars-sized object and it caught up with Earth at 5 kps. 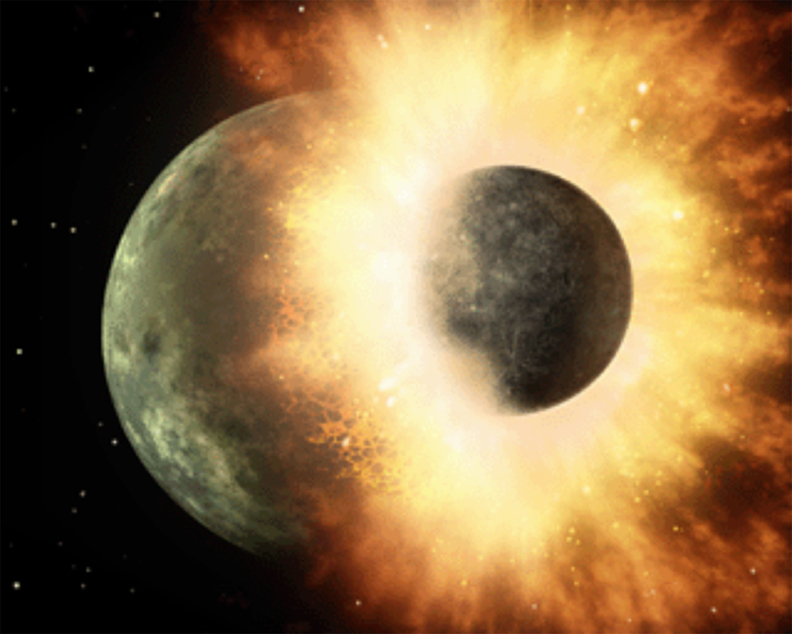 Computer simulations show the mantle of Theia splashing into space to form a system of rings around Earth, which coalesced into the Moon within a few hundred years, while the denser core of Theia took a ballistic path back to Earth, colliding with it a second time but this time sinking in to become part of Earth’s core. However, recent studies of lunar samples show that the rocks brought back are so identical to Earth in isotope ratios that most of the Moon apparently came from Earth’s mantle, without much from Theia. This casts some doubt onto the Giant Impact hypothesis. Clearly there is still much we don’t know about how the Moon formed. This explanation of Dave Black’s is why I truly believe that our Moon was created when a large chunk of earth was flung outward into the space near Earth, when the Earth was still spinning at a much greater speed on its axis! The rocks brought back from the Moon prove they are way too similar for the Moon to have been created from some planetary collision! It formed a series of rings like Saturn’s around the Earth, and the large chunks started to collect the dust and debris until the Moon was formed! The “spin off” theory certainly accounts for the similarities between the Earth and the Moon’s mineral composition. However, the angular momentum necessary to spin off a piece of the Earth would cause the entire Earth to spin apart. The Big Impact theory discussed in this post is a better fit for all the facts we know about the Moon.